Swansea City head coach Paul Clement has warned his players against complacency as they prepare to face managerless Leicester City. Michael Appleton will be in charge of the Foxes following their sacking of Craig Shakespeare on Tuesday. "We have to be ready for a potential backlash or an upturn in form," said Clement. The Swans will be without injured striker Wilfried Bony and suspended midfielder Leroy Fer. However, Clement has allayed fears that Tammy Abraham could be recalled by Chelsea, a notion suggested by BBC pundit Ian Wright. Swansea go into the Leicester game looking to build on last Saturday's 2-0 victory over Huddersfield Town - their first home win of the season. Clement says he is wary of Leicester following Shakespeare's departure. "This is the same every week we play. We have to expect that the best are coming in our opponents," he said. "What will the reaction of the players to the news that happened this week? "We have to be ready for a potential backlash or an upturn in form. We want to go for back to back wins." Clement has sympathy for Shakespeare, adding: "It's a shame obviously when a fellow manager loses his job. We all know and I know the kind of pressures we face week to week. "It's sad because eight games in, he's being judged on results and they have decided to remove him. I wish him all the best hope he gets another position soon." Clement confirmed loan striker Abraham, who took his tally to five goals against Huddersfield, looks set to stay at Swansea throughout this season despite parent club Chelsea having a recall clause in January. He explained: "Tammy is on a season long loan here, but there is a stipulation in place that if he does not meet a certain proportion of games by the halfway stage he can be recalled. "That is a normal thing to have in place on a season long loan. It is to protect the player and to make sure he has the right amount of game time, making sure he is not going out somewhere and sitting on the bench. "That was never in my thought process. It was always that if we were going to bring a player of his ability he was going to come to play . "As we stand there is no reason to think he would not meet that criteria. He's well on course for that, he will be here for the year." Clement said there is no similar recall clause for Portuguese midfielder Renato Sanches from Bayern Munich. He is set to return to the Swansea squad this weekend after being sidelined with a thigh strain, but Bony is still out with a hamstring issue. 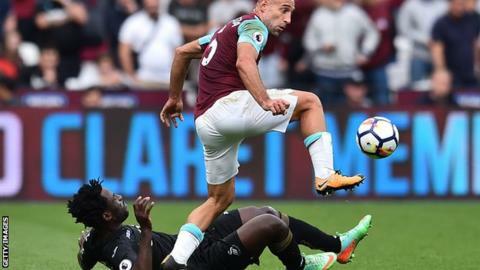 Clement said: "The fact is he has not played regularly for a couple of years. "He had an intermittent pre-season, so his body is a little behind where his mind is. So we have to get the two up to speed as quick as possible. We have to make sure now there are no mistakes going forward. "We have to get him fit, get him ready and implement him back into games at the right moment."